After a week of test runs, and months of delays and construction detours, five Silver Line stations will open their doors at noon Saturday. And if you're a resident of Northern Virginia, you may have a whole new commute waiting for you this Monday morning. The line's first phase -- with stations at McLean, Tysons Corner, Greensboro, Spring Hill and Wiehle-Reston East -- extends the current Metro system by 11.5 miles; riders can travel from East Falls Church through Tysons and on to Reston. If you're wondering how to get to those new stations, though, you might need to rely on buses, carpools or your own two feet. Only one of the five new stations offers a permanent parking lot. McLean (Route 123 and Scotts Crossing Road) is also accessible via the Route 123 pedestrian bridge. There's space for motorcycle parking, a kiss-and-ride area, 26 bike racks and a bus stop nearby. In addition, a temporary parking lot with 700 parking spaces is now open near the station. Parking at that lot will cost about $5 a day during the week, $2 a day on weekends, or $90 per month. Tysons Corner (Route 123 and Tysons Boulevard) doesn't offer parking (no lots or even a kiss-and-ride area), but has a pedestrian bridge over Route 123, as well as 38 bike racks, and six bus bays to serve the station. Keep in mind that parking at the nearby mall parking lots won't be an option. Key cards will be now required to get into lots during non-mall hours. Wiehle-Reston East (Dulles Toll Road and Wiehle Avenue) serves as the line's west end -- for now -- and is the only one of the five new stations to offer a parking garage. 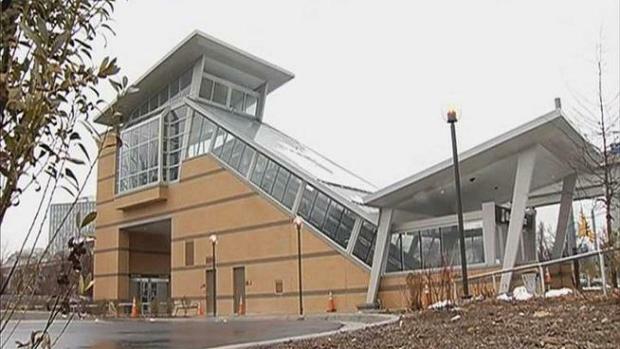 The garage houses 2,300 spaces, and the station also offers pedestrian bridges over the toll road, five bike racks and bus services. Silver Line trains will run every six minutes during peak hours and every 12 to 20 minutes at less-busy times. You can get an idea of fares and travel times online here. As for Blue Line riders, they've already welcomed their new normal. Blue Line trains headed to Arlington Cemetery and Rosslyn have been cut back so Silver Line trains can get through the Rosslyn tunnel. This has caused wait times on the southern end of the Blue Line to increase from about eight minutes to 12 during rush hour. That change arrived for commuters with July 21's morning rush. If you're an Orange Line rider, though, you may see trains arriving more frequently. The Silver Line's second phase will extend to Dulles International Airport, but is not projected to open for about four more years.